CPDD Community Website: Underage Drinking-Related Emergency Room Visits on New Year’s Day, 2009, and Measures to Address This Societal Problem. Underage Drinking-Related Emergency Room Visits on New Year’s Day, 2009, and Measures to Address This Societal Problem. CPDDBLOG wishes you a happy New Year 2011! 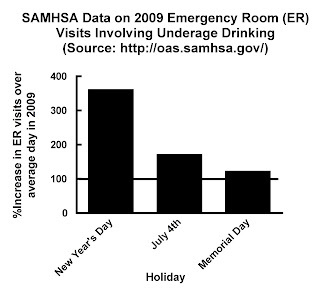 In follow up to last week’s CPDDBLOG post discussing historical data documenting increases in alcohol-related deaths during the Christmas and New Year’s holiday periods, new data were just reported by the Substance Abuse and Mental Health Services Administration (SAMHSA) on emergency room (ER) visits associated with underage drinking on New Year’s day 2009. The Drug Abuse Warning Network (DAWN) data reveal a nearly 4-fold increase in underage drinking-related ER visits on New Year’s day 2009 (N=1980, 363% higher than the 546 visits nationally on an average day in 2009). The New Year’s day visit tally also eclipsed totals on the July 4th (N=942, 73% higher than average) and Memorial Day (N=676, 24% higher than average) holidays (Figure). These statistics are quite sobering, no pun intended, since they likely only reflect the tip of the iceberg in terms of the underage drinking problem we face. For example, there is substantial evidence that underage drinking is associated with the development of adult drinking problems due to genetic or environmental factors including age at first drink and age at developing alcohol dependence. Further, recent data suggest that the structure of brain areas involved in memory and cognition is persistently altered in nonhuman primates after adolescent binge drinking, suggesting the possibility of enduring cognitive deficits in humans after early binge drinking. Together, these findings indicate that it is especially important to identify and treat underage problem drinkers to avoid lifelong alcohol problems and the personal and societal problems they bring. Recent research suggests that the alcohol screening, brief intervention, and referral to treatment (SBIRT) process may be useful for reducing underage drinking and its consequences. For example, screening and brief intervention of underage drinkers presenting to pediatric emergency rooms was shown to modify some drinking behaviors while web-based screening and intervention modified binge drinking patterns. Other encouraging data support the idea that interventions involving electronic resources can reduce problem drinking behaviors and smoking over the long-term. Since underage alcohol problems appear to cluster geographically and socioeconomically, locating SBIRT resources in and heavily publicizing online resources to problem clusters may be especially effective strategies. Alcohol pricing (including taxation) offers another means to reduce alcohol’s deleterious consequences and increased taxation appears to have a disproportionately large effect on reducing deaths due to underage drinking. This is significant in the State of Massachusetts which today (in response to a November 2010 voter referendum) eliminated the 6.25% state tax on alcoholic beverages, after a campaign that according to the Boston Globe, was swayed by alcohol industry money. While eliminating the alcohol tax should result in more alcohol purchases in Massachusetts (versus in bordering states with lower alcohol taxes), it also seems likely that Massachusetts can expect increased underage drinking and its negative consequences.